Congratulations on your engagement! Now comes the fun part of your planning: your wedding registry. We know what you may be thinking. Fine china. A toaster. Fancy serving stuff you’ll never use. There’s nothing wrong with any of these, as long as they’re what you actually want. Your wedding registry reflects you as a couple. It’s your chance to look ahead and choose kitchen and other items that will suit you in the years to come. Whether you first move in together after the wedding or you’re already living together, your registry is an opportunity to blend your tastes, needs, and wants – and maybe do some upgrading, too. 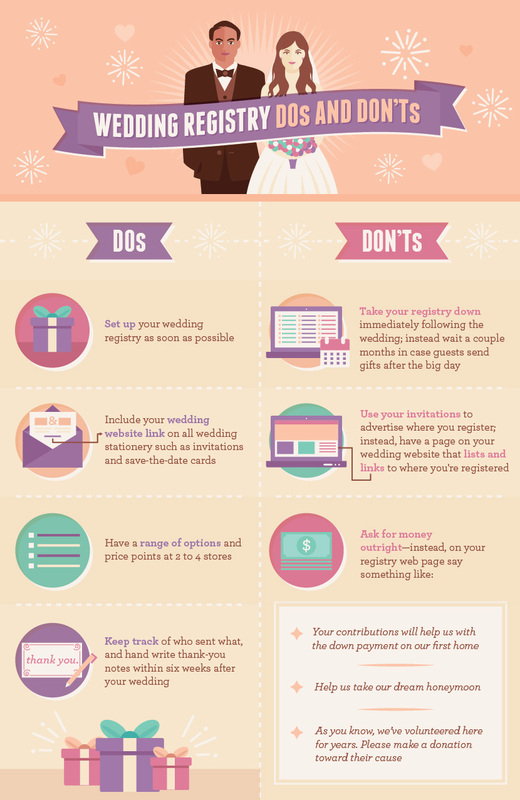 With so many store and online options available to create wedding registries, the whole process can be daunting. But we’re here to help! A wedding registry, also known as a bridal registry, is a wish list of wedding gifts that can be purchased from a particular store or stores. The registry lists the items you’ve selected and which ones are still available, so your friends, family, and colleagues can choose and purchase the right gift for you. After announcing your engagement, be prepared to field lots of questions. Other than basic logistics – like the date and location of the wedding – people may also ask where you’re registered. Wedding guests ask this because they want to support you with gifts they know you want and need as you enter married life. If it helps, don’t think of your registry as something there to serve you and your partner; think of it as a way to show friends and family how they can help you. By completing your registry early, guests can also purchase gifts for your engagement party or wedding shower, and you won’t have to deal with returning a lot of repeat or unwanted items. If you want fine china, register for it. But if you don’t want fine china, you don’t have to resign yourself to having plates you never use. Instead, register for dishes that are both sturdy enough for years of daily use and nice enough for anything from pizza night to Thanksgiving dinner. You aren’t limited to registering at just one store – but on the flip side, having 15 registries may look greedy (and requires too much of your and your guests’ time). Registering at two to four stores is just right. Include a mix of in-store and online options at local, specialty, and national stores. 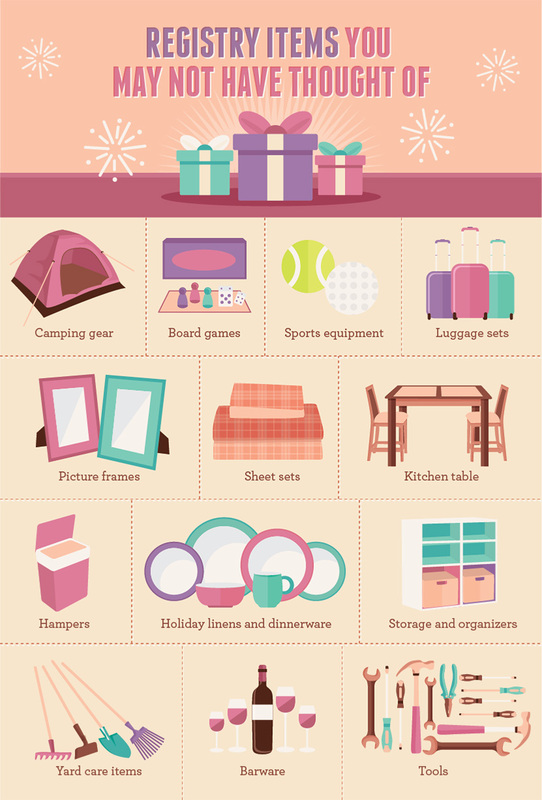 Some guests want to spend big, so don’t shy away from pricey items. But if you’re big coffee drinkers and want your registry to include two inexpensive red plastic pour-over coffee makers and filters that you can use for camping, then go for it. A registry doesn’t have to include only expensive stuff. Be conscious, though, of constrained budgets by including a range of price points. Lastly, don’t feel like you have to put the entire wish list on your registry. If there are things you would rather buy yourself down the road, feel free. After all, it’s nice to know your guests want to help you and your partner get started in married life – but it’s fun to do things for yourself too. With so many stores and items to choose from, the wedding registry process can be stressful. Selecting gifts you’ll cherish for years to come is a great way to set yourselves up as a couple and start your new life together. Give yourself plenty of time to do a little research and choose what best suits you and your partner. You’ll be glad you did!